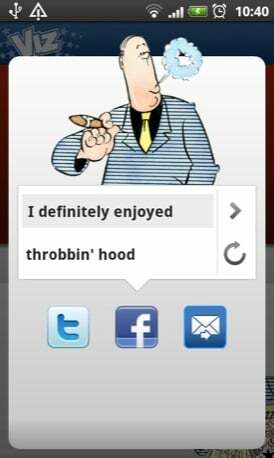 Android App of the Week First published in 1998 Roger’s Profanisaurus is a compendium of words and phrases inspired by the lexicon and philosophy of Viz comic’s foul-mouthed northern TV reporter Roger Mellie. 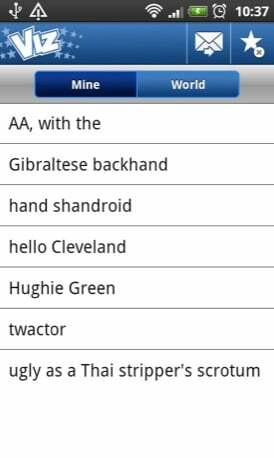 Thirteen years later and "the man from the telly" can now spice up your descriptive and euphemistic powers through this handy app. Never before has it been so easy to find an alternate term to describe an ugly bird, taking a dump, throwing-up or passing wind. For anyone who doesn’t know what Viz is, the entire content of the app is based on sexual, regurgitory or lavatorial undertakings. There is nothing remotely uplifting, pleasant, politically correct or educational going on here. Much of it is bloody hilarious, though. To be honest, with 12,000 entries the quality is a bit variable. Some entries just aren’t all that funny, and some are too self-referential for their own good, but a healthy number will have you on the floor in the hysterics. 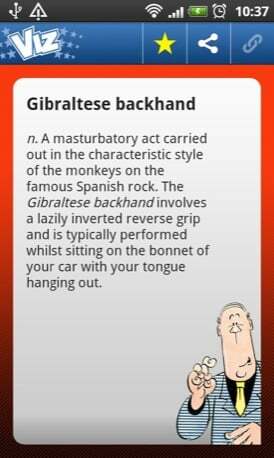 The definition of the “Gibraltese backhand” had me laughing so hard I ran short of breath bringing the other half running into the lounge fearing I’d had some sort of fit or seizure. “Hello Cleveland” had a similar effect moments later. For a light-hearted app, the design and look are of the highest quality. The main dashboard lets you browse phrases alphabetically or search for specific words. You can also browse by subject: romance, perversion, unmentionables, self-abuse... you get the general idea. 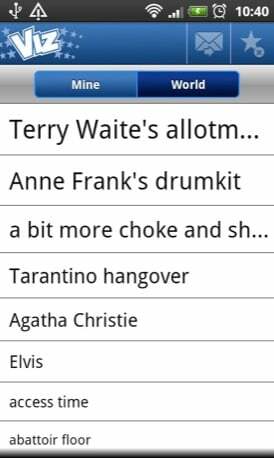 A single tap on an entry will save it to a favourites list for future jocular relief while the cloud button generates 27 random words you may wish to probe further. There is also a shake-to-refresh facility. 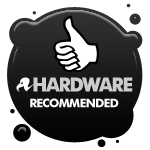 The status screen lets you post content directly to your Facebook or Twitter accounts, and there is a handy 4x1 widget which throws random definitions to your home-screen. A quick tap on Roger and it refreshes instantly. All the rude words and phrases - 12,000 of 'em - you could ever possibly want to giggle at.